360 pages | 130 Color Illus. Television Field Production and Reporting provides a comprehensive introduction to the art of video storytelling. Endorsed by the National Press Photographers Association, this book focuses on the many techniques and tools available in today’s digital landscape, including how drones and miniaturized technology can enrich the storytelling process. 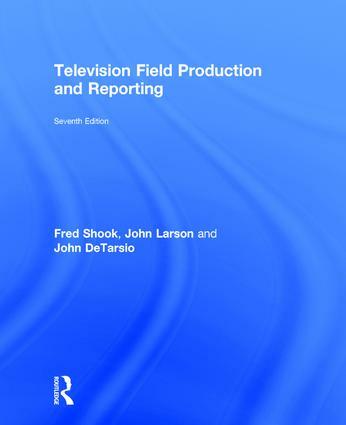 The new edition of Television Field Production and Reporting is an absolute must in this visually oriented, rapidly changing field. At its core, visual storytelling helps transmit information, expose people to one another, and capture and communicate a sense of experience in unforgettable ways. This edition reflects, through practitioners' eyes, how to achieve those goals and excel as a professional, whatever the medium at hand, even as changing technology revises the storyteller’s toolkit. This edition emphasizes digital and emerging media, and includes new color photography relevant to contemporary visual storytelling and reporting. It also features important updates regarding digital media law which affect anyone who records and/or disseminates digital media content, whether in private, on television, the web, via social networking sites, or in commercial venues. The seventh edition of Television Field Production and Reporting stresses the mastery of innovative storytelling practices in video programming as far ranging as electronic press kits, multi-camera production, stylized programs, corporate video, raw documentaries, and real time cinéma vérité. "John Larson’s passion for telling stories that matter finds the heart-pounding dramas in the lives we too often don’t notice." It's true that some people are born storytellers, while others practice and study ceaselessly to improve their work. John Larson is a rare combination of the two. "I watched his storytelling for more than 30 years. It started good and then got better. Even more amazingly, he can tell you how to make that happen." "I would argue that John Larson is the Tom Hanks or Denzel Washington of TV journalism. He is not a one hit wonder, or even a one-decade wonder. His body of excellent work stretches more than 30 years. I can count on one hand a list of whom I consider to be his peers, and have a couple of fingers left unused." "This is a must-read in my classes! The writing is clear and conversational and captures the essence of strong visual storytelling, being prepared and curious. The lessons in this book transcend the classroom and this text has become the bible for doing it right." Journalists have important stories to tell. Stories that can provide a check and a balance to those in power, bring to light societal wrongs, and empower citizens to feel as if they are a part of the process. Television Field Production and Reporting brings together best practices for budding broadcast journalists, and teaches them how to make their stories sing with strong visuals and words. Fred Shook’s professional experience encompasses television reporting, production, writing, photojournalism, and video editing. He has taught at the university level and worked nationally and internationally as a television producer, consultant, writer, director, and editor for commercial television, corporations, and government agencies. Shook is a National Television Academy Silver Circle Member for significant contributions to television over at least 25 years. He received a Rocky Mountain Emmy Nomination for writing, and the National Press Photographers Association’s Robin F. Garland "Outstanding National Educator" award. He also is a recipient of the National Press Photographers Association’s J. Winton Lemen National Fellowship Award for his contributions to television photojournalism. He has written The Process of Electronic News Gathering; Television News Writing: Captivating an Audience; and Television Field Production and Reporting, ed. 1-4, and is lead author on ed. 5-7. John Larson is recognized as one of the nation’s best storytelling reporters. He’s excelled in national and local investigative, breaking, and feature reporting. Larson reports and produces stories for PBS NewsHour, and is a former Dateline NBC correspondent. He also serves as a consultant to hundreds of journalists, and works internationally as a Video Journalist who does it all. His powerful writing has made him a sought-after speaker, teacher, and motivator at workshops and newsrooms across the country. He’s earned multiple DuPont Columbia awards - arguably broadcasting’s Pulitzer Prize, as well as multiple Peabody’s and National Emmys. His award winning work has taken him around the world - investigating drug cartels in Mexico, the sinking of a ferry in Indonesia, police corruption in Louisiana, HIV/Aids in Africa, death of undocumented immigrants at the hands of the US Border Patrol, Racial profiling in the United States, and many others. His investigation of the insurance industry for Dateline NBC became one of the most honored works of journalism in broadcast history. Before going to the network, Larson spent eight years at KOMO-TV in Seattle, Washington. John DeTarsio is Director and Director of Photography for scripted and non-scripted episodic TV, documentaries and magazine shows. As Director/DP of the MTV hit series, Catfish, he helped design the look of the TV series and has been with the show since its inception. His body of work encompasses highly-stylized shows, from the raw documentary look of MTV’s Catfish, CBS 48 Hours and MTV’s Suspect, to the premier network magazine show, CBS 60 Minutes, to multi-camera productions (Coming Home, Lifetime, and Kid Nation, CBS). John has worked for five news stations as photographer, editor, and on-air reporter. At KNSD 7/39 San Diego, he became Executive Producer of Creative Development, before becoming a freelance network photographer and consultant. As a consultant (http://www.johndetarsio.com/), he works with national and international television photographers, editors, reporters, and managers, sharing his passion for visual storytelling. His awards include NPPA National Photographer of the Year, the national Iris Award, six national NPPA awards, and 46 regional Emmys. In addition to twenty-eight San Diego Press Club Awards and nine Golden Mic Awards, he also has received more than fifty regional NPPA Awards.